New President of Korea had her inauguration today. and Korean singer PSY had celebration performance. The new President of Korea is Geun-Hye Park. 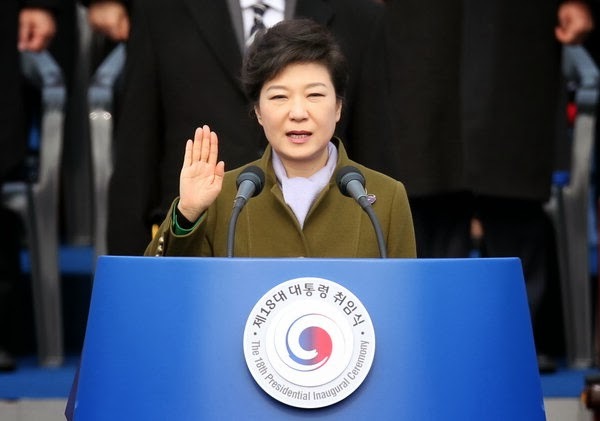 She’s daughter of former president Jung-Hee Park who raised Korean economic revival. He made Korea advanced country. Korea is divided into South part and North part due to the Korean war. Because of this war, Korea fell into poverty and have barely made a living by America’s support. However the former president Park changed this up side down. 950, Korea prop up themselves by the American assistance. 1960, Korea created great global company named HYUNDAI, SAMSUNG. And in 1960, Korea rapidly rose to top 10 world’s major economic power. It has been over 40 years since Korea have received from America. advanced to the semifinals in 2002 Korea-Japan World cup. Also, Korea was ranked in 5th of 2012 London Olympic. Currently 10th rank in world economy, Korea feels sorry for impoverished America. All of these are started from the former president Jung-Hee Park. Geun-Hye Park, the daughter of the former president Jung-Hee Park. will make Korea as top 5 world’s major economic power. According to TIMES, Korea is predicted to be 2nd world’s major economic power in 2050. Korea is already Top 10 in economy. We started our new epoch today.